Set sail for a day of adventure during this 10-hour speedboat tour of the famous Blue Cave and islands near Split. Zoom across the Adriatic Sea to Bisevo Island, home to the ethereal blue light of the Blue Cave. Continue exploring nearby islands and caves, including Stiniva Bay and the Blue Lagoon, snorkeling, swimming, and sunning at each stop. Finish in the historic city of Hvar, enjoying lunch (own expense) and time to visit its charming fortress. A guide, entrance fees (except for Hvar Fortress), light refreshments, and snorkel gear, are covered. - No water or light breakfast was provided on our tour voucher it clearly stated this would be provided, and when this was raised to the tour guides they apologised saying sorry our boss didn't tell us to buy breakfast, so the 10 of us on the tour did not have any food until lunchtime. - On the Blue Cave tour stop, our tour guide simply disappeared after providing us our tickets with almost zero explanation, and we were left on our own the other tour guides stayed there organising their groups to make sure the whole group boarded the same Blue Cave boat together . This caused the group split so we had to wait for the other half group to return from a separate Blue Cave tour. - The tour guides although nice enough, seemed little interested / exhausted / overworked maybe? so we were not provided much information at all regarding the places were were visiting. 1 or 2 sentences at the most. - What was meant to be a visit to the Green Cave, ended up being a 10 second in and out halfway into the cave, we could not see anything and before we know it the visit to the Green cave was over. - The worst part and the most disappointing part was that the tour voucher clearly stated that lunch would be in Hvar , and that we would have time to wonder around the island. Hvar was the part of the tour that not only us but the rest of the passengers were looking forward to the most. Instead, our tour guides took us to another island across Hvar called Carpe Diem where the one and only lunch option was a beach club overprice and terrible food however I guess this is the place the tour company had a commission arrangement with. Me and my partner are foodies and we had book lunch at a wonderful restaurant in Hvar however we were left with no other option but eating at the Beach Club only option , and stay there for 2h vs the 40min quick visit we had in Hvar. This is unacceptable and extremely disappointing. Well worth the beautiful boat ride out to the Blue Cave. Amazing to see the color of the water and cave! Quick day trip, worth the time spent on the water! Great tour, able to see many different cove, great staff. Incredible day visiting the blue cave and the islands. 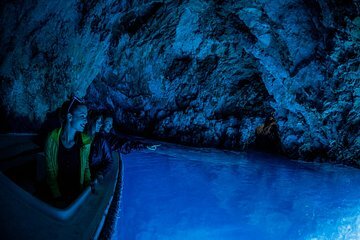 The blue cave is an amazing experience that you must do if you are visiting the Dalmatian coast. We had lots of opportunity for swimming and our tour guides were very lovely. Would definitely recommend! Great tour and a great way to see a number of islands in a short period of time. It was unfortunate that we couldn't enter the Blue Cave due to the filming of Mamma Mia/a high tide but this couldn't be helped. The situation was handled very well by the staff who tried to sort an alternative out but this was not possible either. The boat ride was awesome as were the tunes that accompanied us on our trip! The speed boat trip was quite an experience but it should be better disclosed so one can have a better idea of what to expect. First - the trip to the Blue Cave is very long and we ended up there completely wet since we were sited on the last raw of the boat. We thought that that was bad so we requested to change sits and we were move up front - WORSE choice ever as the water impact is worse sitting up front that in the back, so on the next stop we moved back and fortunately we didn't get more wet than we were already. Because the duration and the speed and the water impact wasn't fully disclosed - it gets very tough on your back and knees if you are trying to stand up to try to make the water/waves impact less. Very tough really and it's a long period of time between stops. I thought I was going to loose a kidney during this trip. We had a woman in our group who mid way started to cry and demanded to be left on one of the islands to take the ferry back as she couldn't take it any more. Her words this is not what we've signed up for and I can't enjoy the view because of the speed and the water impact on the boat She stayed on one of the islands. Blue Cave experience - exceptional, but the Boat ride itself - not great. You get used to it after a while but like I said - Thank God I didn't loose my kidneys. All in all - I think you should describe the trip/speed/and potential issues in more details so if one signs up for this knows exactly what to expect. If you are going to go to Hvar just take the ferry rather than do it on a tour. You really need a full day or more to take it all in. The tour operators were great. Unfortunately we had bad conditions so didn't get to see the Blue Cave at all : but we got a small refund at the end of our tour and the rest of the time spent was beautiful!